Following World War II, the British withdrew from their mandate of Palestine, and the UN partitioned the area into Arab and Jewish states, an arrangement rejected by the Arabs. Subsequently, the Israelis defeated the Arabs in a series of wars without ending the deep tensions between the two sides. The territories Israel occupied since the 1967 war are not included in the Israel country profile, unless otherwise noted. On 25 April 1982, Israel withdrew from the Sinai pursuant to the 1979 Israel-Egypt Peace Treaty. Israel and Palestinian officials signed on 13 September 1993 a Declaration of Principles (also known as the "Oslo Accords") guiding an interim period of Palestinian self-rule. Outstanding territorial and other disputes with Jordan were resolved in the 26 October 1994 Israel-Jordan Treaty of Peace. In addition, on 25 May 2000, Israel withdrew unilaterally from southern Lebanon, which it had occupied since 1982. In keeping with the framework established at the Madrid Conference in October 1991, bilateral negotiations were conducted between Israel and Palestinian representatives and Syria to achieve a permanent settlement. In April 2003, US President BUSH, working in conjunction with the EU, UN, and Russia - the "Quartet" - took the lead in laying out a roadmap to a final settlement of the conflict by 2005, based on reciprocal steps by the two parties leading to two states, Israel and a democratic Palestine. However, progress toward a permanent status agreement was undermined by Israeli-Palestinian violence between September 2003 and February 2005. An Israeli-Palestinian agreement reached at Sharm al-Sheikh in February 2005, along with an internally-brokered Palestinian ceasefire, significantly reduced the violence. In the summer of 2005, Israel unilaterally disengaged from the Gaza Strip, evacuating settlers and its military. The election of HAMAS in January 2006 to head the Palestinian Legislative Council froze relations between Israel and the Palestinian Authority. Ehud OLMERT became prime minister in March 2006; following an Israeli military operation in Gaza in June-July 2006, he shelved plans to unilaterally evacuate from most of the West Bank. The kidnapping of two Israeli soldiers by Lebanese Hizballah led to a 34-day conflict in Lebanon in June-August 2006. 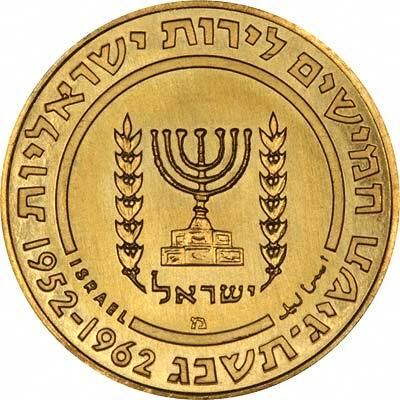 Although Israel has issued it's own coins since 1948, its first gold coins were issued in 1960. Until 1980 the coin denominations are in Lirot (Pounds) and mils (100 mils =£1). From February 24th 1980 to 1985, after a coinage reform, they are denominated in Sheqalim (Shekels). 10 Old Agorot = 1 New Agorah; 100 New Agorot = 1 Sheqel. 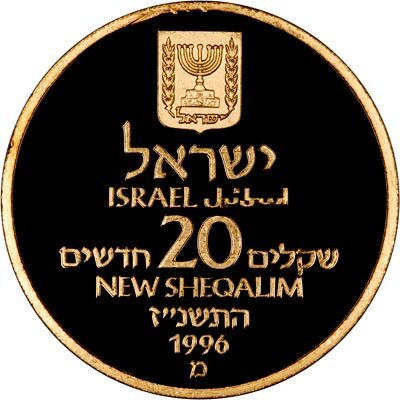 10 Sheqalim = 1 Agorah; 1,000 Sheqalim = 1 New Sheqel. If you can understand that the first time, you are doing better than we are! Alloy or Fineness = Fineness of gold. 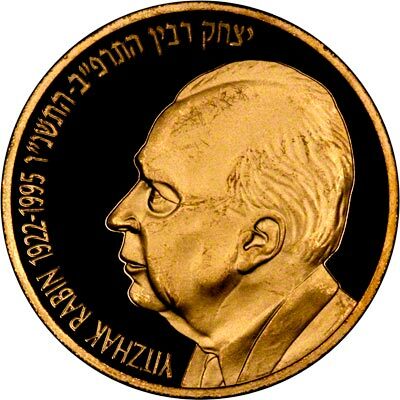 For silver and base metal coins of Israel, please look at our original Chard Coins website. 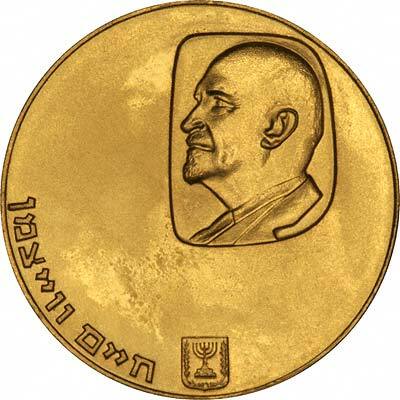 We make an active market in almost all world coins, gold or otherwise, including Israeli gold coins, whether listed on this page or not. If you have any of these coins to sell, please contact us, or post them to us for appraisal and offer.